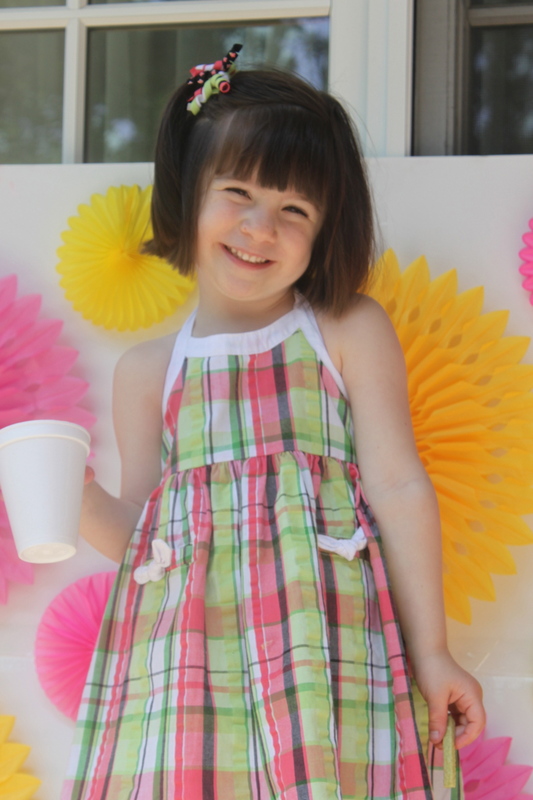 My sweet, sweet Molly just turned 2, and her lemonade and lollipops birthday party was this past weekend. I had so much fun designing and planning the decor. Everything turned out really sweet and I think everyone had a great time! 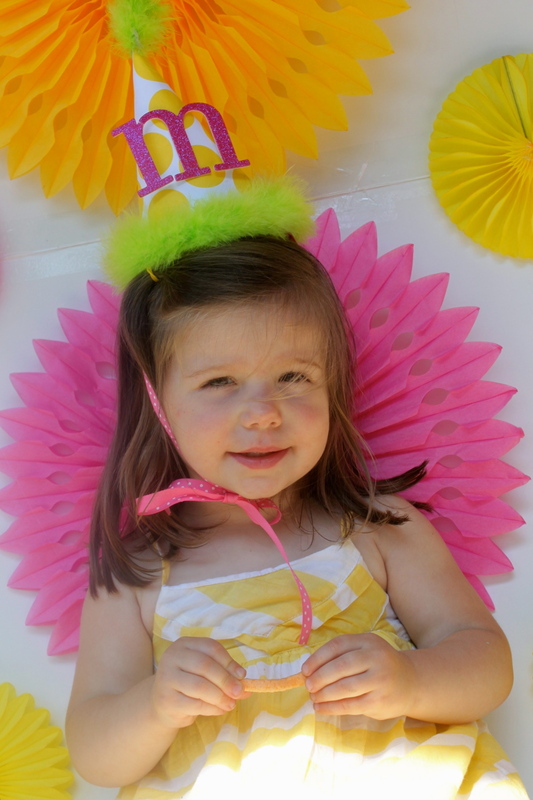 A few weeks before the party I asked Molly what kind of party she wanted and she said, “Lollipops!” Since Madison had a Candy theme party a few years ago and I didn’t want a rerun, I pressed her further. “What else do you like?” I asked her. 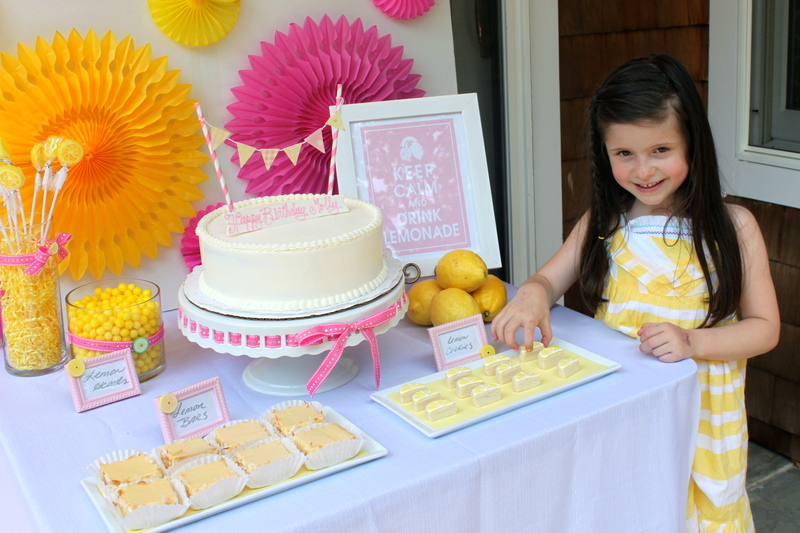 She said, “Lemonade!” And that is how the theme was born. I combined lollipops and lemonade and ran with it. I chose pink and yellow as the colors since those are the colors I think of when I think of lemonade. 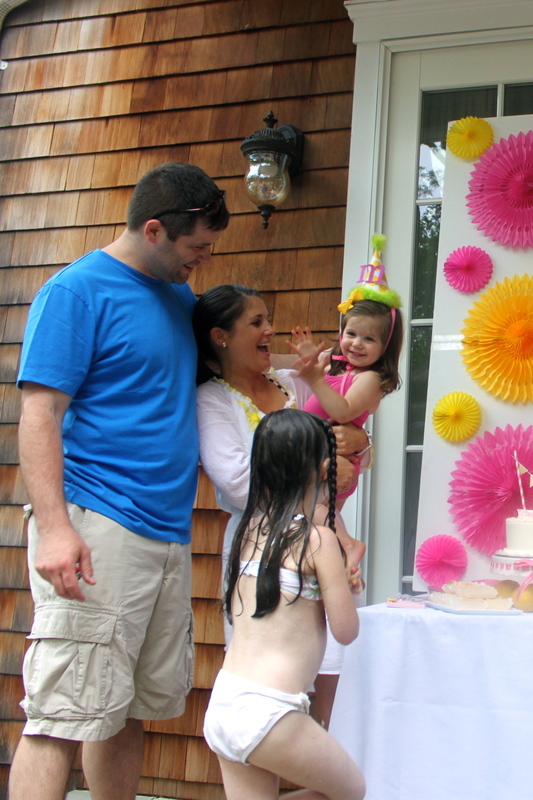 We chose the same location as her Strawberry 1st Birthday Party…Aunt Bonnie’s pool. 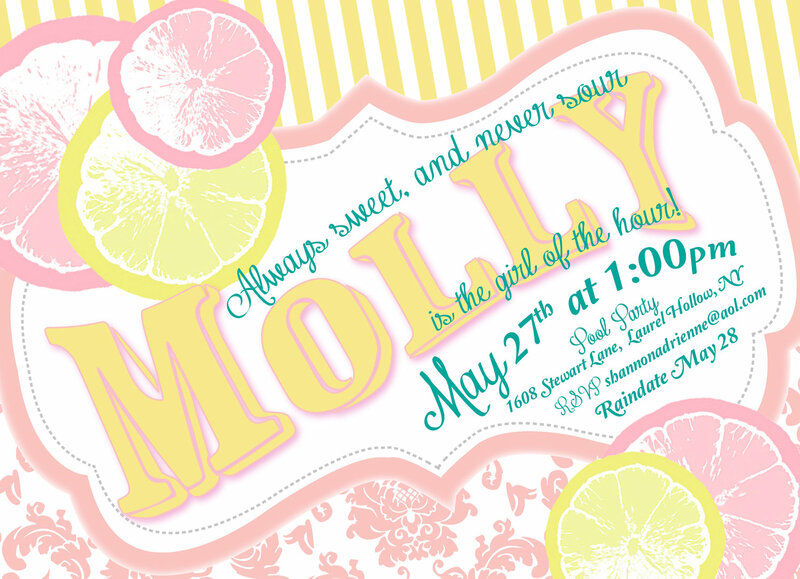 I started with these invitations I found from Hello Love Boutique on Etsy. They were super cute and fit the theme perfectly. After the invites were ordered and mailed, I went on Pinterest for a little inspiration and put a little board together with everything lemonade and lollipop that I could find. I also spent one day running around to Party City, Michael’s, and Target looking for all the cute little pink and yellow details I could find. I found these great hanging fans at Party City and bought large and small ones in pink and yellow. Instead of hanging them, I cut off the tops and hot glued them to a craft board. It made the perfect backdrop for the dessert table. I opted for small for this year’s dessert table. I’ve found that people are shying away from sweets for themselves and their kids, so a table full of sweets isn’t as big of a hit as many party blogs make them seem. Colorful desserts are beautiful and look great on a table, but what good are they if no one is eating them? 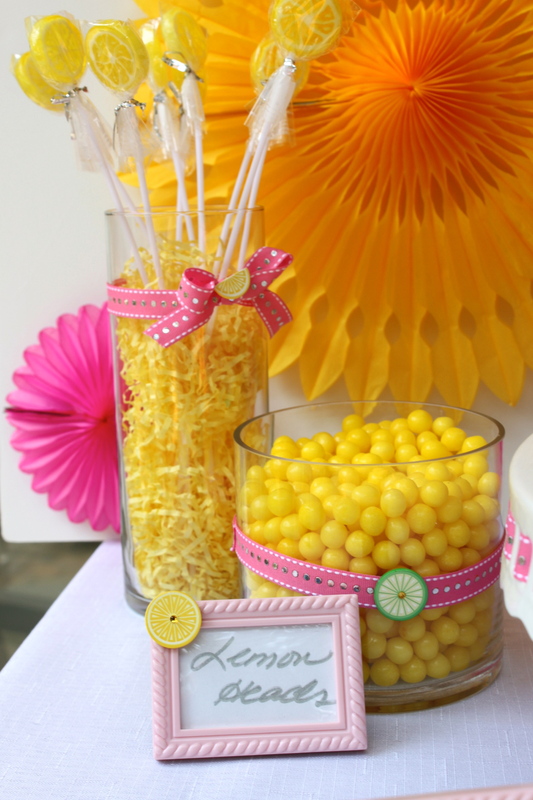 I found some lemon shaped lollipops at Party City which worked perfectly in a tall vase since the sticks on them are extra long. I went back to my childhood when I spotted Lemonheads at Michael’s. How perfect for this theme! 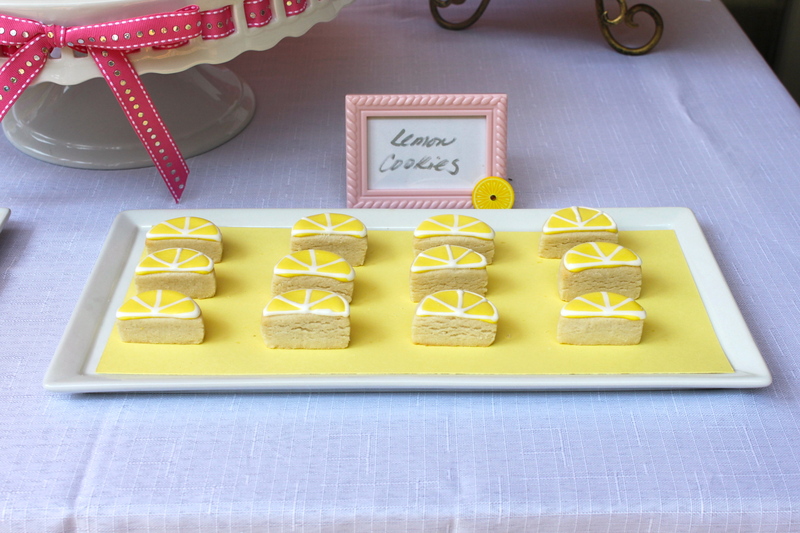 I used sweet little pink frames from the baby shower department at Michael’s and embellished them with lemon scrapbooking stickers and used them to label the food and drinks. I ordered some really cute mini lemon shaped cookies from Sweet Art Sweets on Etsy too. I only ordered two dozen, but should have ordered many more. They were delicious and went so quickly. The perfect size cookie for little ones though. 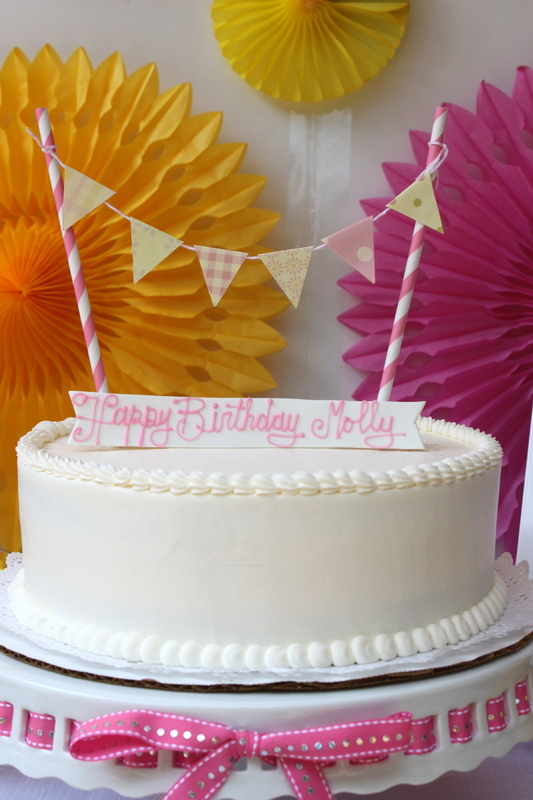 I chose a lemon curd filling for the cake from our favorite bakery…Cornerstone Caterers in Rye, NY. While picking up the cake I spotted lemon bars in the dessert case and figured it was meant to be and picked up some of those too. Now I had the makings for a perfectly small and lemony dessert table. How cute is the “Keep Calm and Drink Lemonade” print! I think the folks at Cornerstone were a little in shock when I ordered a plain white (on the outside) cake. They are normally in for a little more time-consuming arts and crafts projects with my cakes, but I had other plans this year. 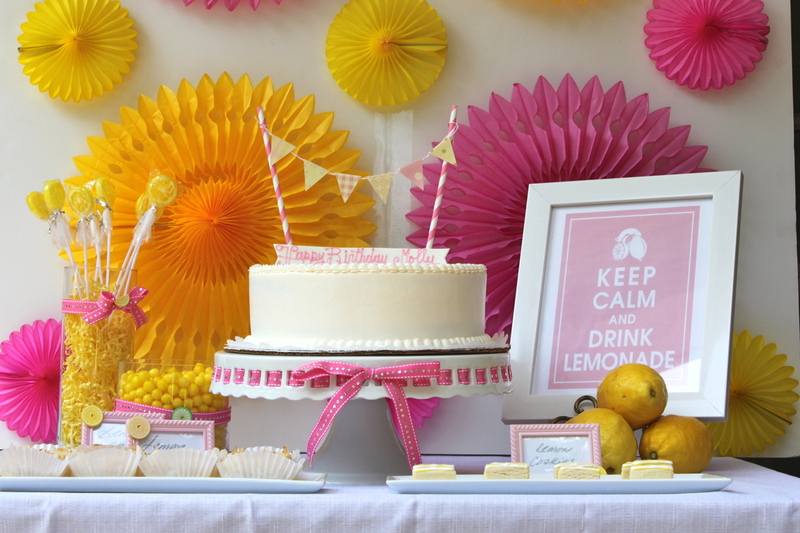 I’ve been eyeing those pennant banner cake toppers flying around Pinterest and blog world and decided that would be the perfect topper for a lemonade party since it reminded me of a lemonade stand. I constructed mine using pink and yellow patterned scrapbook paper, some pink baker’s twine and two striped paper straws. Super easy and super cute! Cornerstone gave me their signature “Happy Birthday” fondant banner that I just leaned against the straws. I like that the cake is a little plain so the emphasis is on the cute little topper. It literally took no more than 5 minutes to whip up this adorable topper. 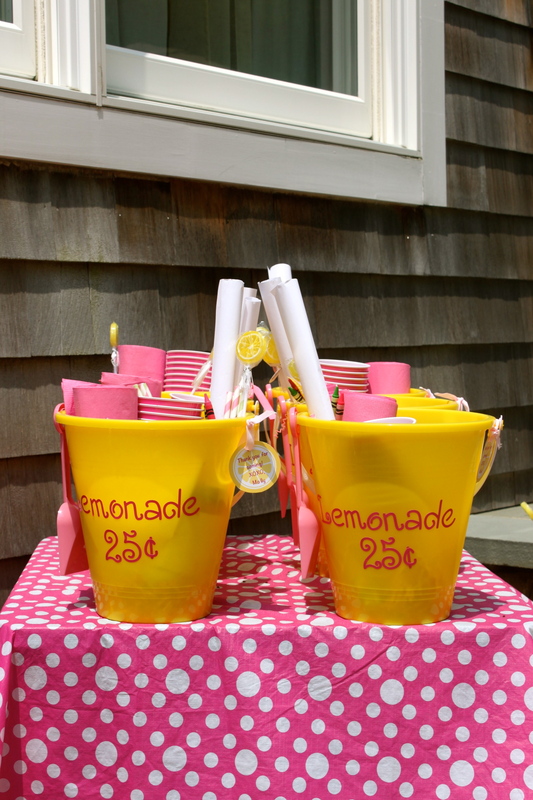 For favors, I found a cute idea on Pinterest that linked to this site with a free printable for a “make your own” lemonade stand bucket. 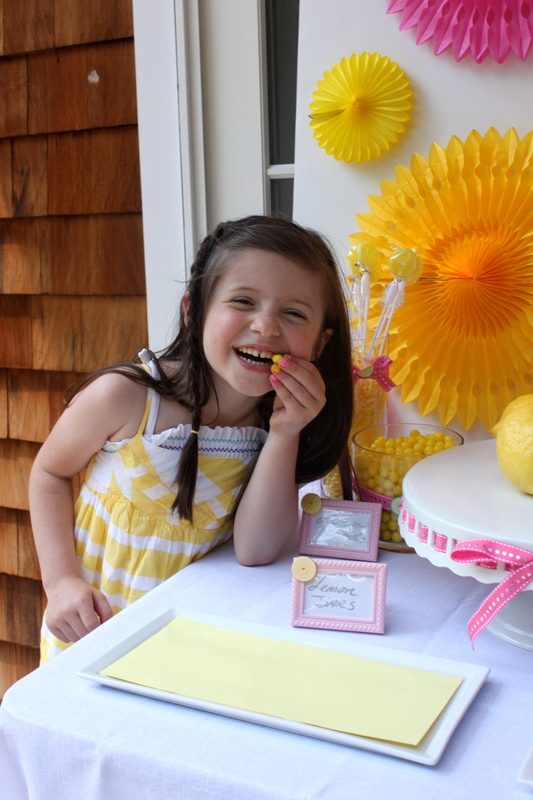 I thought it was adorable and the perfect favors for a lemonade party. I found small Mason jars at Michael’s and filled them with some store-bought lemonade mix. I also found the buckets at Michael’s and spent a few extra minutes switching out the shovels on the yellow buckets with pink ones…it’s all gotta match, right? I got some pink letter stickers while I was there to spell out “Lemonade 25c” on the buckets. 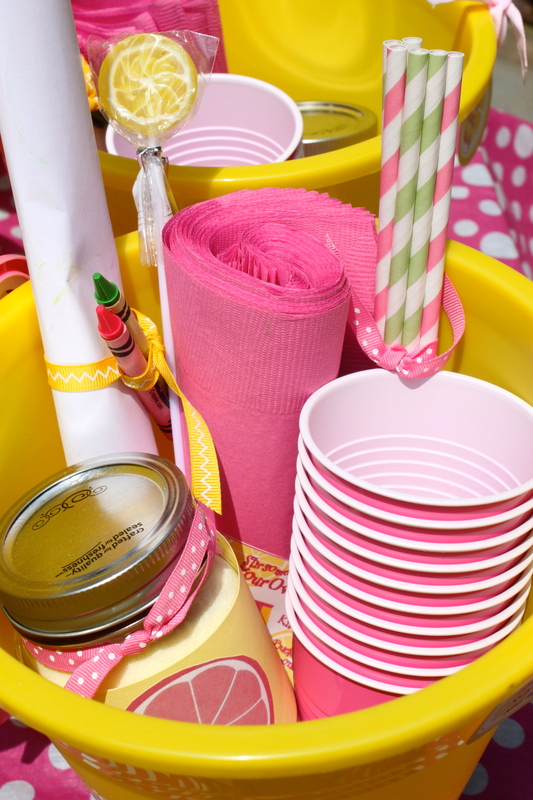 In each bucket I placed ten pink cups, napkins, and fancy paper straws. I also rolled up a sheet of paper, tied it with ribbon and tucked in a pink and a green crayon so the kids could make a sign for their lemonade stand. Here’s a good to know tip…you can order a box of crayons on Crayolastore.com and customize it with any colors you choose. I was able to order a pack with just pink and green crayons. 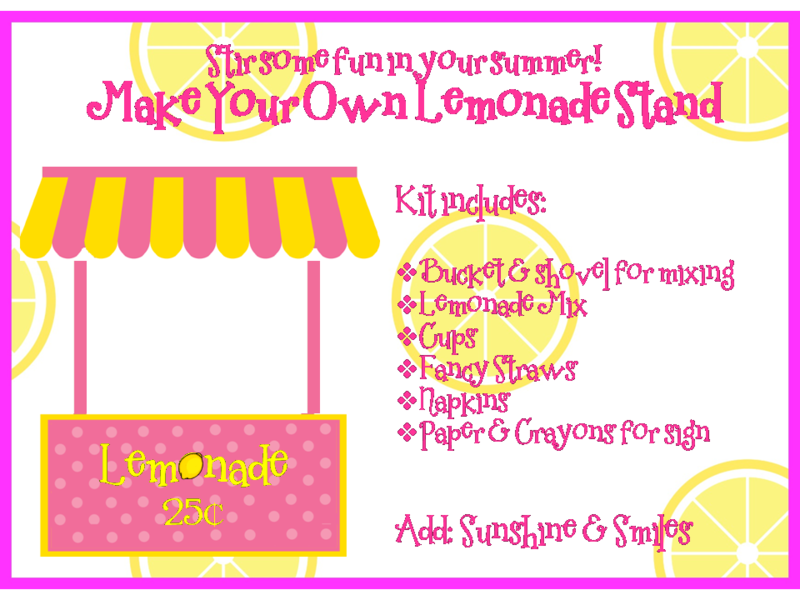 The lemonade kits turned out super cute. I embellished the jars with some ribbon and wrapped them in scrapbook paper with a lemon on the front. The kids were super excited to get them. They couldn’t wait to get home and set up a lemonade stand of their own! 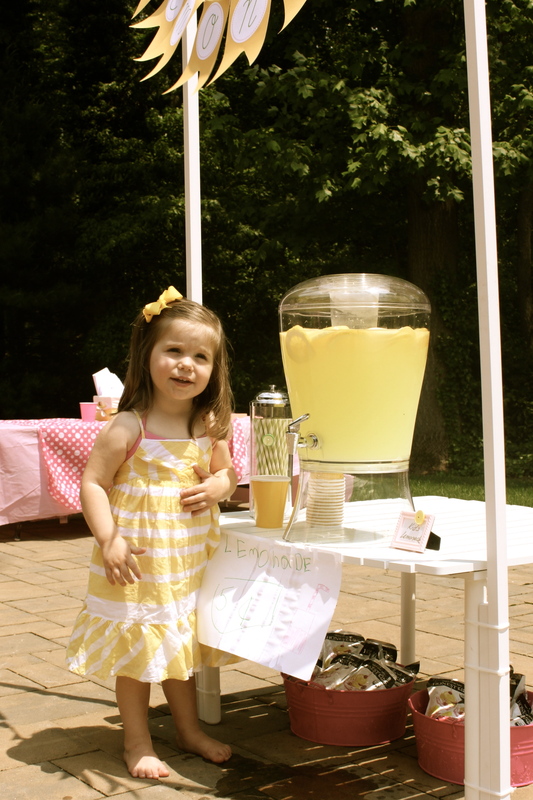 What lemonade party would be complete without a lemonade stand? Now we don’t own a lemonade stand, but I figured I’d try my hand at making one. Now I don’t know how to use saws and power tools, so the lemonade stand I would make would have to be super-duper easy and could not require sawing and painting or anything super time-consuming. While at CVS one day I spied a white wooden table that could roll up and fit into a bag. I thought it was really neat but didn’t know when I would use it so I walked on. A few weeks later and two nights before the birthday party I was back at CVS buying that table. 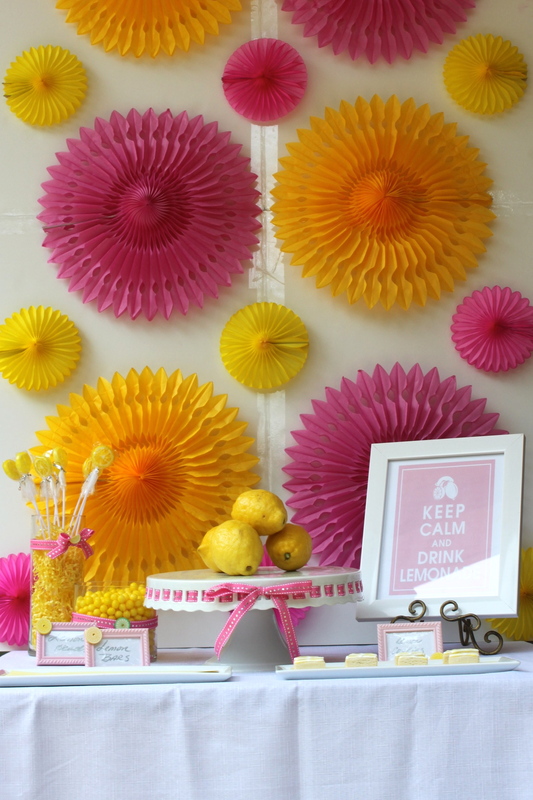 How perfect for a lemonade stand! Next stop was Home Depot where I picked up a long white piece of wood and had a Home Depot employee saw it in half for me. I picked up a few cable ties and two screws that had a ring on the top and crossed my fingers that I could pull off a lemonade stand. Well it worked! I attached the two pieces of wood on either side of the table and secured them to the table legs with cable ties. The hubs twisted the screws into the tops of the wood. 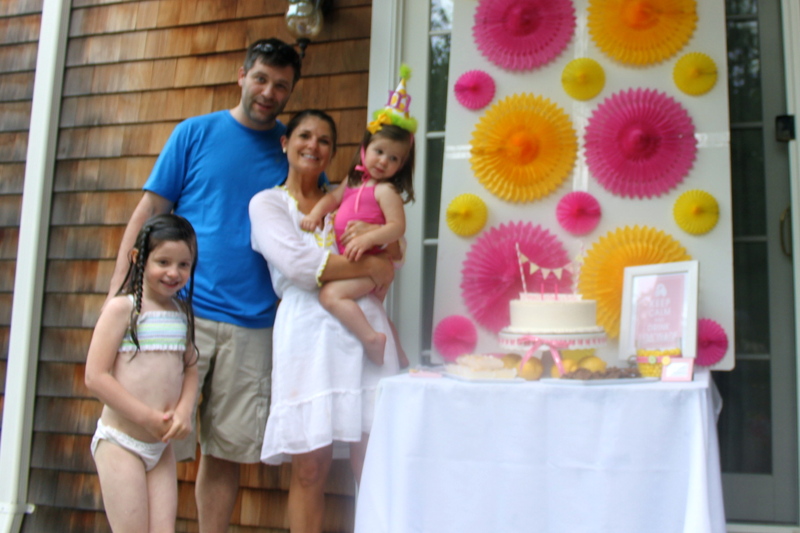 I draped a banner across the top, tying the ends on the circular screws and called it a lemonade stand! 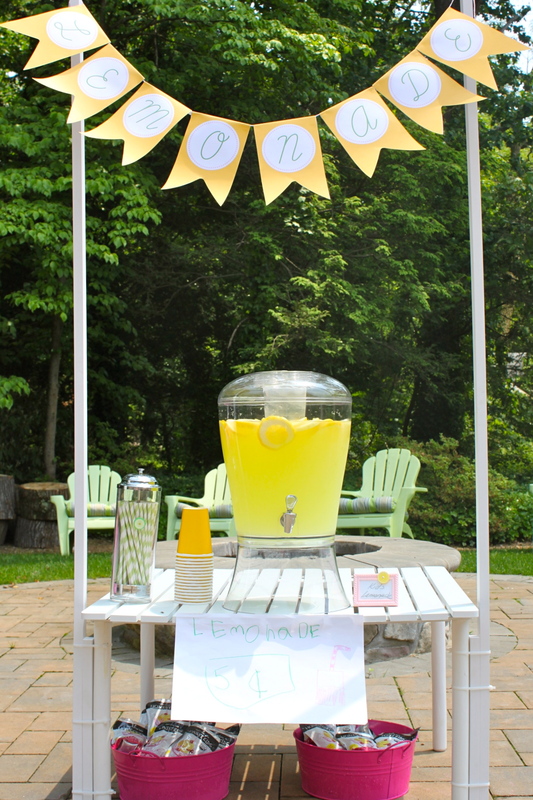 My 6-year-old made a sign for the front and we put a big beverage dispenser of lemonade so the kiddies could help themselves! I also had plenty of Honest Kids pink lemonade juice boxes on hand. 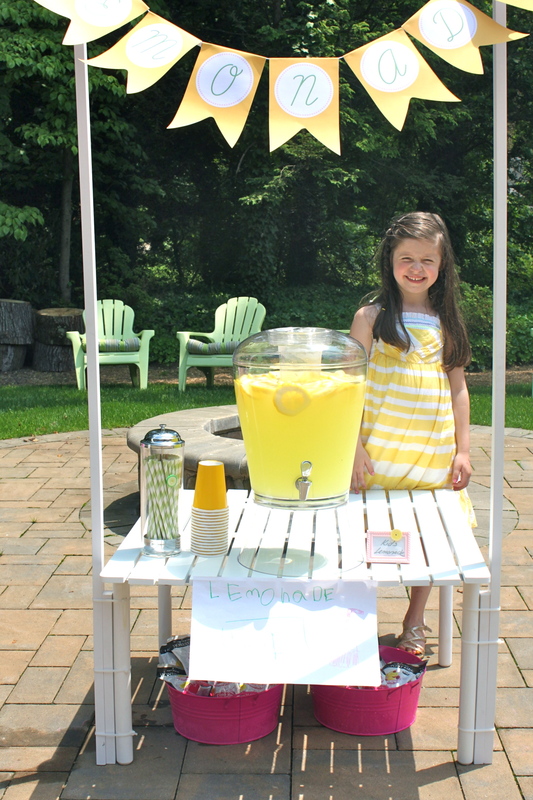 Here’s Madison at the lemonade stand. This was her favorite part of the party. 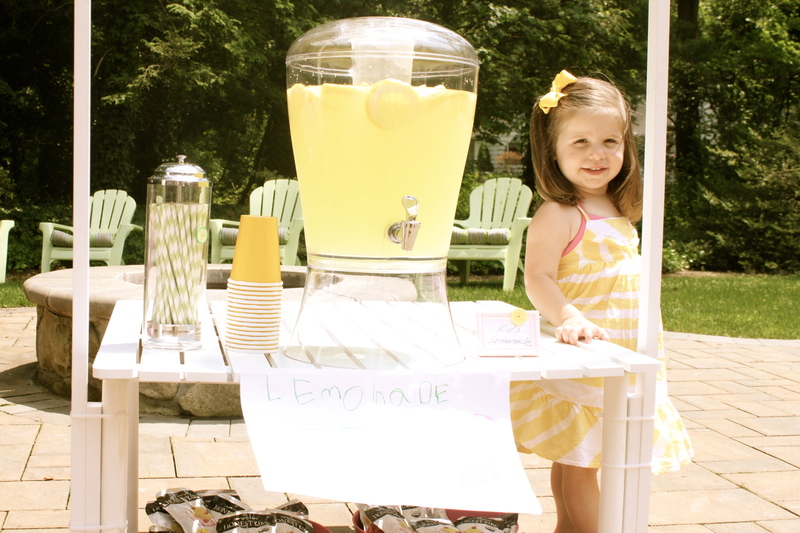 She really wanted to collect money for the lemonade! We grilled steaks, chicken, vegetables, and had a yummy pasta salad for the adults. 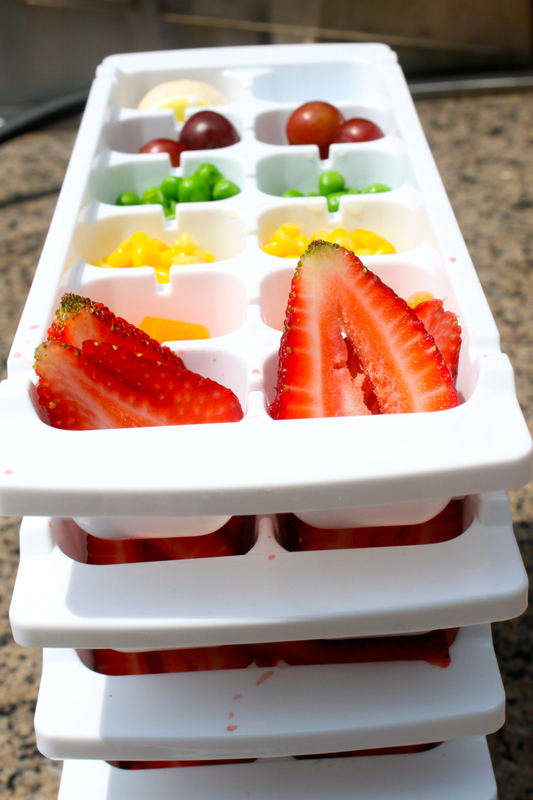 I made these cute trays for the kiddos with a rainbow of fruit and veges. Another Pinterest find! 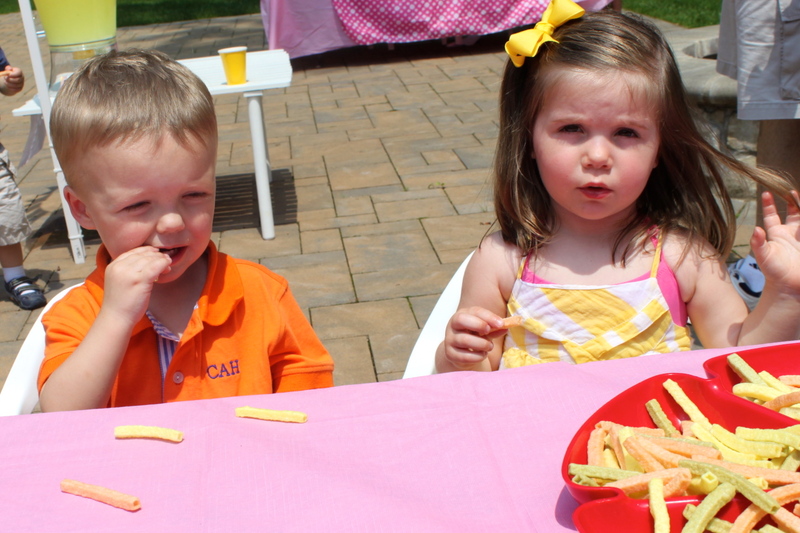 Mac and Cheese and chicken nuggets rounded out the kiddie menu. The adult beverages consisted of Skinny Girl Margarita, Sangria, and a yummy vodka lemonade with crushed mint leaves. 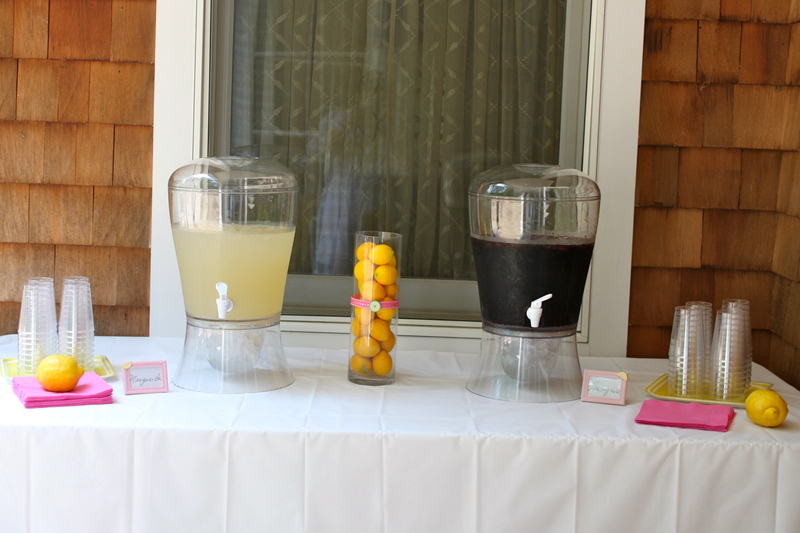 I used self-service beverage dispensers which made it nice and easy to serve the drinks. Everyone had a great time swimming and running around. 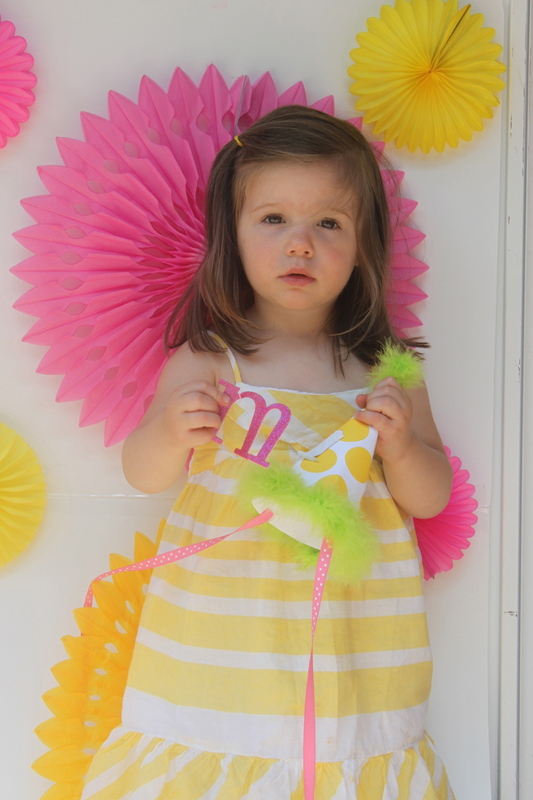 It was a perfectly sunny day in May and the perfect way to spend Memorial Day Weekend and Molly’s 2nd birthday. Happy 2nd birthday my “always sweet and never sour” 😉 baby girl. Mommy loves you very much. I hope you enjoyed your party. 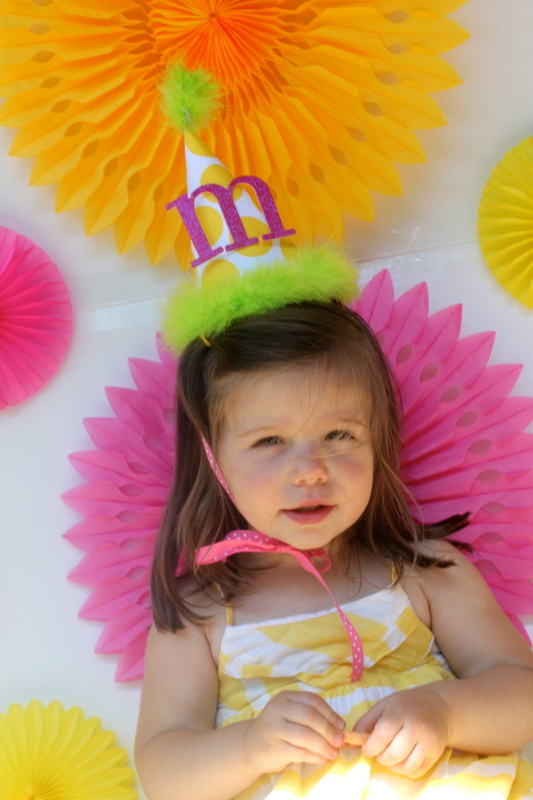 I forgot to mention….I whipped up her party hat with left over scrapbook paper and boa trim from Morgan’s Care Bear Party and added a pink chipboard M! She decided she didn’t want to wear it anymore and tore the M right off. Good thing the party was over! You are so amazing, Shannon! 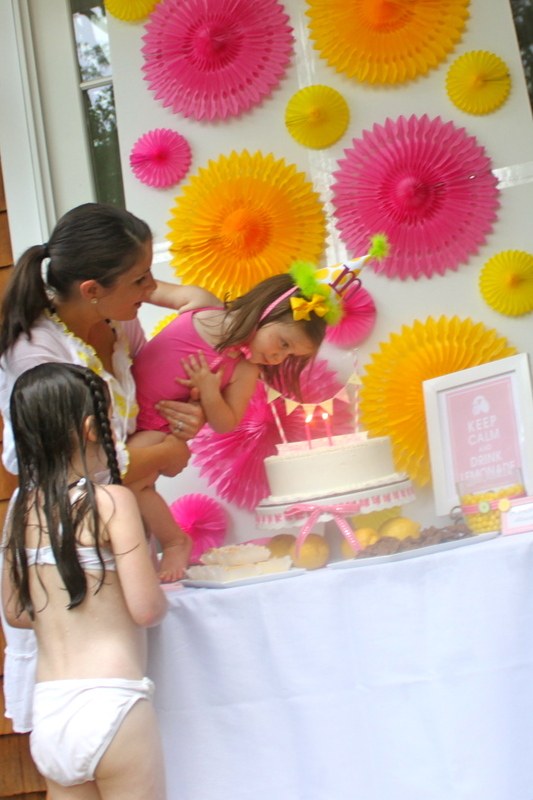 Party planning is your forte! So creative and super cute. 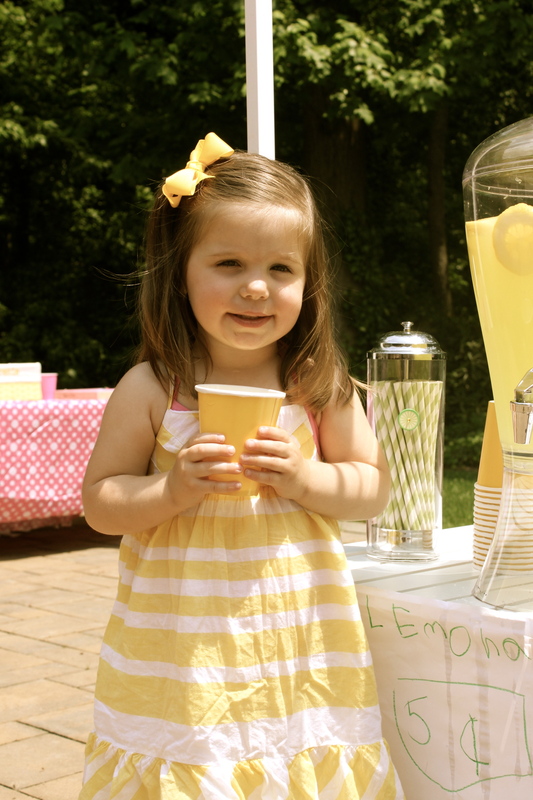 You inspired Madeline to do a lemonade stand this summer. We had a great time at the party, and you never cease to amaze me with your talent and creativity. Happy birthday, Molly!!! And this was a last minute decorating job??? You get mother of the year!!! What a precious theme and colors scheme. I love it! Miss you Shannon…give Ryan a hug for me and tell him I think Molly looks most like him. She is beautiful just like the other two!